Community animals are picked up at the shelter and transported to a low cost clinic in Bloomington, IN where they are spayed/neutered. The animals spend the night at the medical facility and are returned the following day. Fees average about $50 to $85, however Floyd Co residents on government assistance or meeting income eligibility requirements may qualify for further reductions in fees. Vaccinations and other services are offered at the time of surgery for additional fees. You must pre-register and pre-pay in order to participate . For more information about this affordable program call us at (812) 948-5355 or come in to the shelter in person. Many people ask for access to low cost preventative vaccines and health care services. 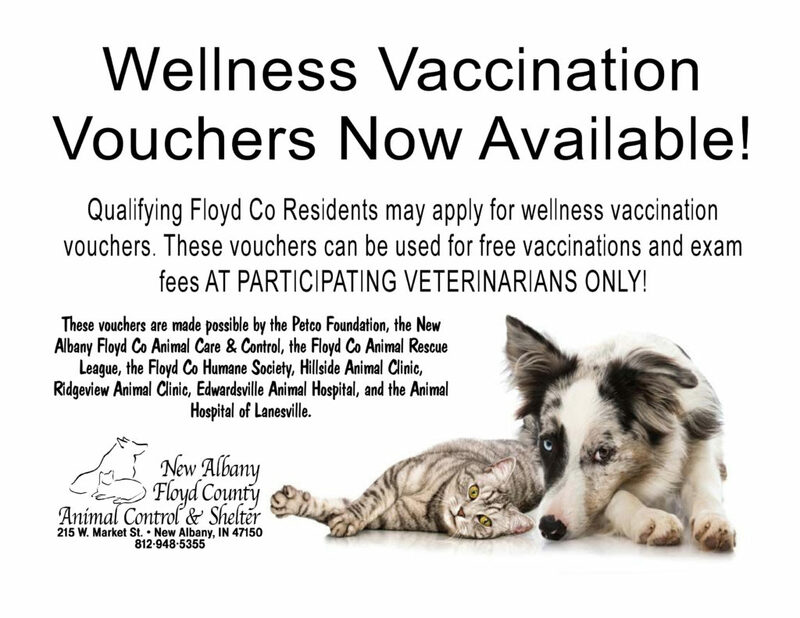 Besides our spay neuter services, we also offer a wellness program for qualifying Floyd Co residents. Our vouchers can ONLY be used at participating clinics. Please call for more information. The Kentucky Humane Society’s S.N.I.P. Clinic operates a Healthy Pets Program to provide low-cost wellness examinations and vaccines for owned animals. The Healthy Pets Program will not diagnose or treat illness or injury in animal clients. Owners of pets that need additional care will be given a list of veterinarians in their area. The program will be open every Saturday from 9 a.m. to 4 p.m. on a first-come, first-serve basis at the S.N.I.P. Clinic, located at 2445 Crittenden Drive in Louisville. No appointments are necessary.